Whiskey in the Jar at St John's Church, Bamford, on September 18. The sounds of fiddles, banjos and great Irish ballads will be ringing out in the Hope Valley as Irish band Whiskey in the Jar raise money to aid a charity which supports refugees. Their concert at St John’s Church, Bamford, on September 18, will raise money for the Sheffield based organisation ASSIST whose work with refugees include those arriving from Syria. 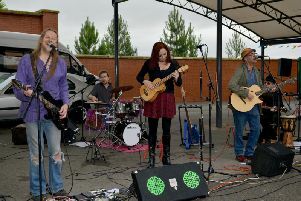 Formed in 1999, the band played a role in the revival of Irish music pubs in Liverpool and Manchester, and were soon spending their summers touring across the west of Ireland. Latterly, the band have concentrated their efforts on bringing the repertoire of Irish songs and tunes to smaller venues and audiences where they feel they enjoy entertaining most. “This is why venues like St John’s Church are so important to us,” said band leader Phil Taylor, whose adopted grandfather John McGuiness hailed from Terenure, Co Dublin before emigrating to Middleborough and then settling in Eyam. “We love to be able to laugh and chat with our audiences rather than sing from afar, it’s important they feel part of the entertainment,” he added. Tickets costing £7 (£5 concessions) for the concert are on sale from Bamford Post Office, www.wegottickets.co.uk and directly from Phil on 01433 651523.